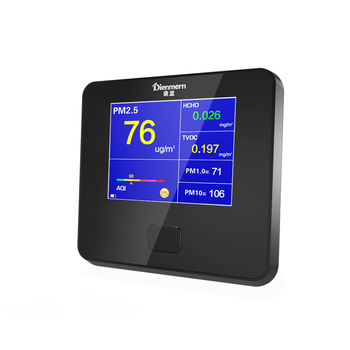 It iS Pocket-sized,Very Convenient to Carry and Measure The Air Auality Around You. This Device Can Measure PM ,HCHO,TVOC. Besides, This Detector Can Be Programmed and Revise the Interface According to Your Preference. We Will Provide The Programming Instruction. Will Show The Actual Data. If Randomly Moved, The Data Will Be Inaccurate. production and sales,is located in the economic zone of Shenzhen,which covers a space of 1000 square meters large. We are the professional manufacturer who specialize in Popular promotional Electronic technology gifts, Wearable products, Electronic wearable products , Smartphone accessories , Car accessories ,Season products ,home products . We have done business with large Company like Vtech, Hama , Tesco , Amazon , Volkswagen, KFC , Disney.....You can find our products selling on supper market such as Walmart . We have good busines and markets Europe,America,middle east and Australia, Chile from South America , Malaysia,Singapore . We always belive that : Quality , Sevices , Details determine sucess and failure. 1.What is the sample policy ? Sample policy: Buyers need to pay the sample fee and ship cost . Customize Logo and OEM Package when mass production are available . 3.What is the payment term ? T/T (Bank transfer ): 30% deposit and balance after inspection before delivery. 4. What’s the Warranty of Your Products?